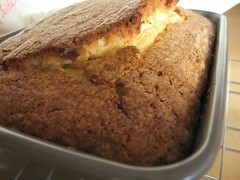 Lemon Pound Cake - Do You Know The Muffin Man? Notes: There is a serious typo in the hardcover edition, in at least the 1st printing: in addition to the all-purpose flour, the ingredients list should include 1 ¾ cups of cake or pastry flour (substitute an additional 1 ¼ cups all-purpose flour). I found this out from the authors' website, which, since it's all in Flash, isn't indexed by Google (yet). Very fine, delicate crumb, with a convincing lemon flavour. A bit too dry, but I may have baked it a little too long.